This book is a translation and update by the author of her popular Russian-language book about people types, considered a classic in Socionics. The field of socionics (personality type along the lines of Jung’s theories) is fully covered in this book for American readers; the author is one of the leading socionists in Russia/Europe. The examples and discussions are written at a lay level and are meant for the every day reader. They are not meant as advanced study for psychologists or Socionics experts, but rather, as the subtitle states, as an introductory volume. 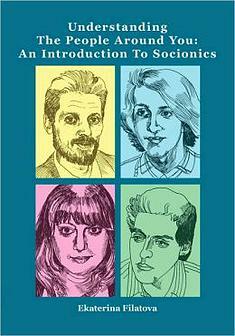 This popular book now has a spin-off series, Socionics in Everyday Life, with a small book dedicated to further delineating each personality type in the original book. The spin-off series is being written (four books published, two books in production, 10 more planned) by Kacee Quinelle, friend of Ekaterina Filatova, in memory of “Katya” who died in 2015.